Whenever we took the freeway through Anaheim when I was a kid, I would gaze out the car window at a familiar image in the distance: the Matterhorn at Disneyland. To me it represented the Promised Land. I remember making a vow to myself that when I became an adult, I would go to Disneyland every day. When Disneyland first opened in 1955, visitors were charged for each attraction. Apparently there were a lot of complaints that Walt Disney was nickel-and-diming people, because Disneyland came up with a ticket book. There was a certain ticket in the book that was more important than the rest. You guessed it: the E ticket. That is what got you on the Matterhorn (the best ride back then) as well as the Monorail and the Submarine Voyage. I still enjoy going to Disneyland, though I haven’t kept my vow to go every day. But there is a far better paradise that I am looking forward to now. The final chapters of the Bible describe that paradise, which God has created for us in heaven. In the first book of the Bible, we see paradise lost. But in the last book of the Bible, we see paradise found. The good news is the admission price to heaven already has been paid. There won’t be any nickel-and-diming, and there won’t be any need for E tickets—or any other tickets for that matter. The admission was purchased for me—and for you—by Jesus on the cross. One day there will be restoration. Handicaps will be gone. Mental and physical disabilities will be nonexistent. There will be laughter. There will be joy. C. S. Lewis said it well: “Joy is the serious business of Heaven.” In God’s presence is fullness of joy—no E ticket required. “Do you value the teaching and encouragement you receive fromA New Beginning with Greg Laurie? When God doesn’t make sense, when it seems that He is asleep, when it feels like He doesn’t care, we must remind ourselves of His promises. Going back to God’s promises, we find something that we desperately need in those hard times: perspective. 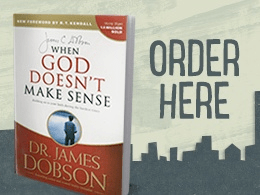 That eternal perspective is the focus of Dr. James Dobson’s book When God Doesn’t Make Sense, which we’re offering as a thank-you to anyone who gives a gift of support to Harvest Ministries this month.